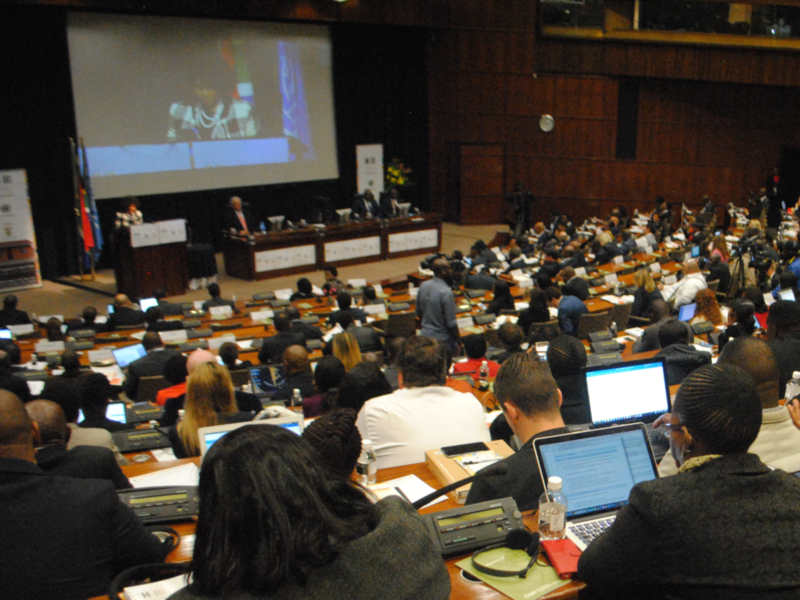 The Habitat III Thematic Meeting on Informal Settlements concluded on 8 April on a high note, as 400 delegates from 50 countries, representing national and local governments and non-governmental organizations, converged for the two-day meeting held on 7-8 April 2016 in Pretoria, South Africa. The Meeting was organized by the Habitat III Secretariat and hosted by South Africa’s Department of Housing and Human Settlements. The Urban Journalism Academy, a workshop for the media held on 6 April, got the Meeting off to an energetic start. The technical session was facilitated by Mbulelo Tshangana, Director General of the Department of Human Settlements of South Africa, Simone D’Antonio of Euthropia, Neal Pierce of Citiscope and Mpumelelo Mkhabela of South Africa National Editors Forum. Guest speakers included the Secretary-General of Habitat III Dr. Joan Clos who demonstrated the importance of urbanization and how it should be seen as a tool for development where cities provide factors of production rather than a problem. He shared the platform with the Deputy Minister of Human Settlements, Ms. Zoliswa Kota-Fredericks. More than 40 journalists took part in the Academy. The Academy was followed by site visits to Cosmo City project. In his statement at the opening ceremony on 7 April, Dr. Clos stated that urbanization is most prevalent in Africa with 61.7% of the population living in urban areas. He added that any city at low levels of economic development is bound to have slums as has been the case throughout history. He however emphasized that urbanization generates wealth, and if used effectively as a tool for development, will help nations to unlock the question of informal settlements. In five plenary sessions, the Meeting discussed a wide array of topics relating to informal settlements, including urban planning, financing, participatory approaches in planning, sustainable neighbourhoods, policy and strategy frameworks and slum upgrading. More than 30 speakers, from experts in urban issues to representatives of non-governmental organizations, national and local governments, the United Nations, and the media, took part in the various panel discussions. In addition to the plenary sessions robust discussions around the theme of the meeting took place in 10 Side Events, Exhibitions held by up to eight organizations, a Women’s Caucus, the Urban Journalism Academy, and Site Visits, as well as through various radio and TV interviews and social media. The Pretoria Declaration, the outcome document of the Thematic Meeting on Informal Settlements, will contribute to the New Urban Agenda. In her closing remarks, Ms. Sisulu the South Africa’s Minister for Human Settlements commended the meeting as having met its goals of coming up with a declaration that incorporated the pertinent issues discussed at the Meeting as well as the significant contribution it will make to the New Urban Agenda, particularly its goal of a policy position addressing the eradication of all informal settlements in the next 20 years. The Meeting was part of the preparatory process leading to the Habitat III Conference taking place in October 2016 in Quito, Ecuador.